Performer, director, teacher, and author Peter Gould (second from left) received the Ellen McCulloch-Lovell Award in Arts Education in 2016. Each year the Arts Council recognizes outstanding individual and organizational contributions to the arts in Vermont with a variety of awards. These are presented at public ceremonies and provide an opportunity for the recipient to be honored by colleagues, friends, family, and members of the communities where they live and work. This award is the most distinguished recognition bestowed by the State of Vermont. Accordingly, it is reserved for Vermont artists who have had a profound impact on their field within the state of Vermont and beyond. The Governor selects the recipient from a list of nominations compiled from across the state and vetted by the Arts Council. The award is given to a person (or persons) of distinction in the arts as evidenced by one or more of the criteria for the Governor's Award for Excellence in the Arts. The Walter Cerf Medal is presented to individuals who have made a sustained contribution to the arts and had an impact on Vermont's cultural life. The award is named in honor of the late philanthropist Walter Cerf whose generous gifts, exceeding $5 million, have benefited numerous Vermont institutions including the Arts Council. Mr. Cerf was instrumental in establishing the Arts Endowment at the Vermont Community Foundation, and his contributions have created a $1 million fund to assist Vermont's artists and arts organizations. Selected by the Council, the medals may be awarded to artists of renown or to those in a closely related field, such as philanthropy, administration, production, education, advocacy, or mentoring, according to the criteria for the Cerf Medal. 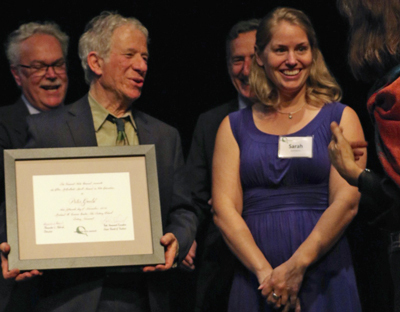 This award is presented to individuals who have made a sustained contribution to learning in and through the arts and/or had a positive impact on the quality of education in Vermont. The award is named in honor of Ellen McCulloch-Lovell, former Executive Director of the Vermont Arts Council and President of Marlboro College. Recognition may be for work done on the local, statewide or national level, and is expected to focus on, but not be limited to activities related to pre-K through 12 education. Selected by the Council, the award may be given to arts educators, professional teaching artists, teachers, or administrators and others whose work has substantially improved student engagement in and knowledge of the arts, according to the criteria for the Ellen McCulloch-Lovell Award. This award is presented to an individual who has an established and well-deserved reputation in Vermont as an advocate for the arts and their impact on Vermont. The award is named in honor of former Council chair and artist Peggy Kannenstine whose spirited work on behalf of the arts has benefited numerous Vermont institutions including the Arts Council. Recognition may be for work done at the local, state, or national level. Selected by the Council, the award may be given to Vermonters committed to furthering the arts in fields such as accessibility, administration, education, mentoring, philanthropy, production, wellness, and others according to the award criteria for the Kannenstine Award for Arts Advocacy. The award is named after the Council’s founding executive director. In addition to his critical work at the Arts Council, Williams’ long career included public school teaching, serving in the Vermont Legislature and chairing the effort to restore the Vermont State House. The award is given to those who mirror his selfless public service and devotion to artistic excellence as one vital ingredient in a robust community as well as his desire to see the arts thrive. Selected by the staff of the Vermont Arts Council, this award is given to a person or organization for meritorious service to the arts in Vermont, according to the following criteria for the Arthur Williams Award. sending an email to the Council with "Award Nomination" in the subject line. Include your name and contact information. Also list three to five achievements, based on awards criteria, that qualify this nominee for the award and provide one to three links to information about the nominee that support this nomination. Occasionally, people or companies worthy of recognition by the Council do not fit comfortably into one of these categories. Parties interested in nominating such an individual or business should still use the form and make the case for recognition.